‘Witness 1979’ is an unprecedented exhibition by Iranian photographer Hengameh Golestan on show in London. 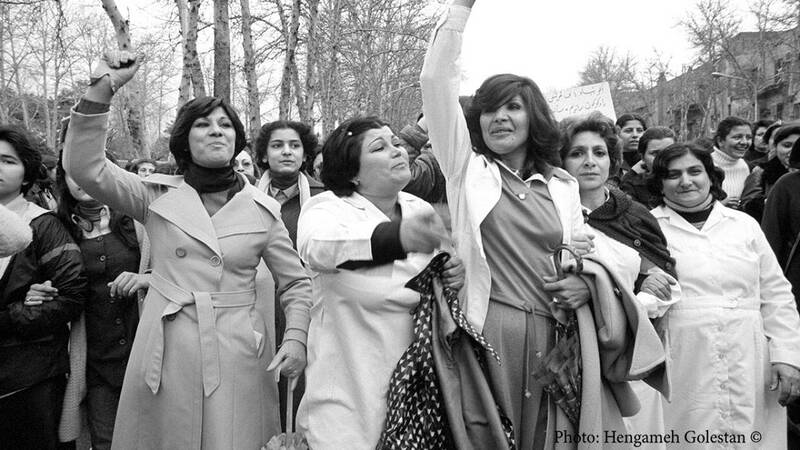 The photos, never published before, document the day in March 1979 when more than 100,000 women gathered on the streets of Tehran to protest against the new Islamic government’s hijab law, which ordered women to wear a headscarf to leave the house. Golestan is also involved in a number of workshops and discussions alongside the exhibition aimed at challenging present-day perceptions of Iranian history. “We decided to dedicate the project in a public program, an exhibition with a workshop, reading groups and symposium to unfold this important moment in the history of feminism in Iran,” said co-curator Azadeh Fatehrad. Born in 1952, Hengameh Golestan initially worked as a photographer in her home city of Tehran, focusing mostly on the everyday lives of women and children, in often mundane domestic detail. In 1984, after the 1979 Islamic Revolution, she moved to London with her husband and son. Her husband, photojournalist Kaveh Golestan, was killed in 2003 after stepping on a land mine while working for the BBC in Iraq. “While Hengameh Golestan’s photos have caught the attention of many including those interested in the art of photography, contemporary Iranian history and women’s rights, it remains impossible to hold such an exhibition in modern-day Iran,” said Euronews’ correspondent in London, Ali Kheradpir.